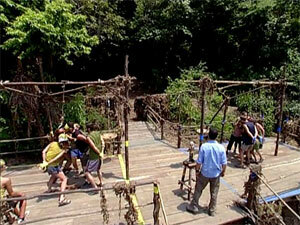 The contestants gather at the back of the riverboat, and Probst calls out names sending them to specific boats. When the fifth woman heads to the same boat, it becomes clear the tribes are women vs. men. Jaburu (women) and Tambaqui (men) paddle to their separate camps. Tribes start off with all 8 tethered together, go through Tough Nut obstacle, retrieve a key to unlock, make two groups of four. After crossing a net, one group (Butch, Roger, Matt, Alex; Jenna, Christy, Shawna, Deena) decodes a message with a code wheel. Answer reveals key that will split tribes into four pairs. After all cross balance beam (Daniel blows a huge lead), two solve a puzzle (Dave, Rob; Jeanne, Joanna). 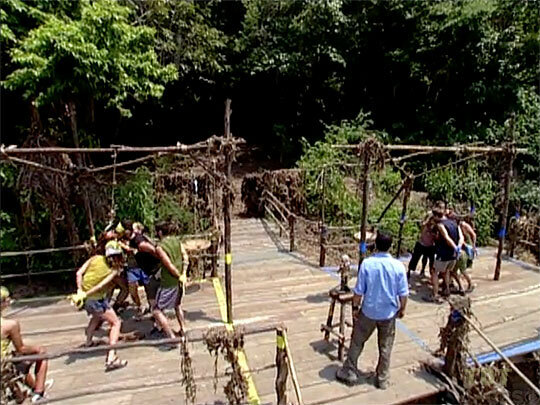 Once solved, one person (Heidi) climbs a structure, rides the zipline to retrieve the final key, unlocks a gate, and allows their tribe to cross the finish line. Jaburu has a lead on the puzzle, wins. Ep1 IC: "Unchained" - Jaburu wins. Christy sits out. 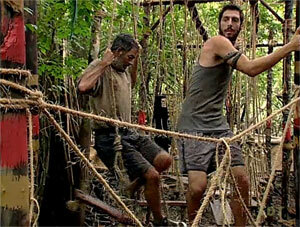 JoAnna, Butch are "guides" (callers) as blindfolded pairs of tribemates retrieve 30 planks from the jungle. Once all are retrieved, blindfolds are removed, and the tribes use the planks to solve a puzzle. Jaburu gets a huge lead due to poor calling by Butch, easily wins, receives fish bait. Shawna sits out. 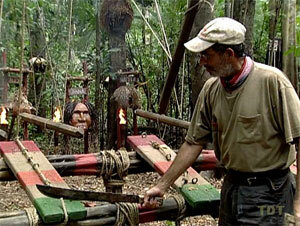 Tribes have two minutes to explore a replica Amazonian village, then must answer 10 questions based on what they saw. Correct answers: Rob, Butch, Alex, Jenna, Matt, Heidi, Roger, JoAnna, Dave, Jeanne. Rob and Deena both miss the ninth question, with Tambaqui leading 6-4, Tambaqui wins. Ep2 IC: "Total Recall" - Tambaqui wins. TC2 - Janet voted out (5-1-1-1), 14 players left. 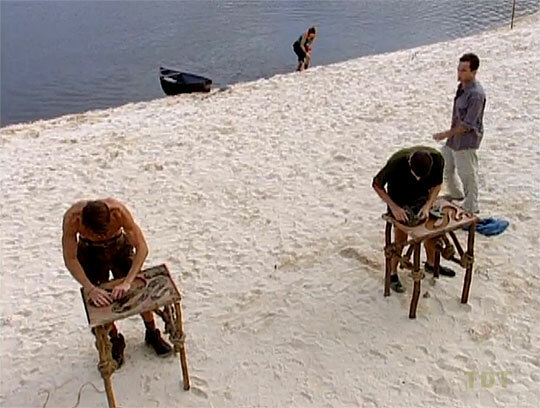 In a version of Concentration, there are 35 pairs of items, concealed (5 items each) in 7 boxes, one for each tribe member. 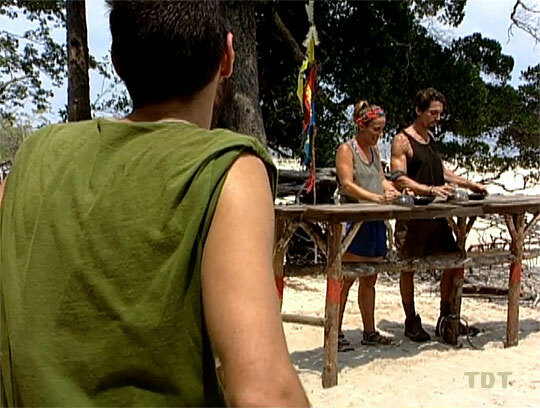 Contestants must ask someone (on either tribe) for a matching object. If they have it, that person collects the pair and scores a point for their tribe. 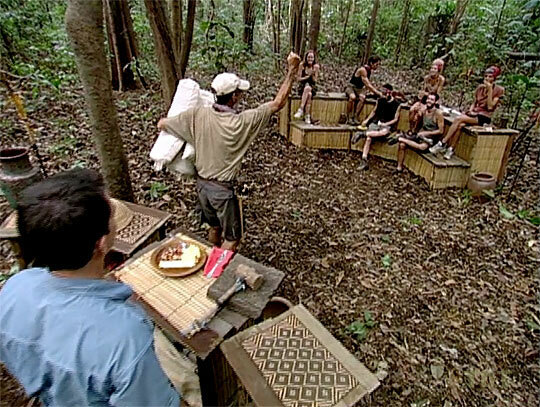 Shown matches: Dan, Roger, Matt, Christy, Jenna, Butch, Shawna, Deena (on the item Rob asked Heidi for; after which Dan immediately asks Heidi for the same item Rob did). Jeanne scores the final point, and Jaburu wins, 18-14. They receive soap, shampoo, toothpaste, and other hygiene items. Each tribe is trapped in a cage. Each must untie knots to release a machete, untie more knots, then cut a rope with the machete to remove a board. That releases a pole, use the pole to retrieve three sets of keys, use the keys to unlock locks, and open the hatch in the top of the cage. 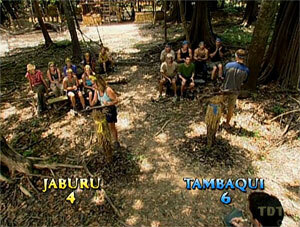 Tambaqui is still trying to remove their board when Jaburu retrieves their final key, and Jaburu wins easily. Ep3 IC: "The Great Escape" - Jaburu wins. Jenna sits out. Tribes must build fire to burn through a series of four ropes, releasing four parts of a tribe banner. First to do so wins a fridge full of Coke. Jaburu gets an early lead with two sections, but Tambaqui passes them and wins, 4-3. Shawna sits out. Tribes have 1 hour to catch as much fish (by weight) as possible. Unsurprisingly, the experienced fishermen on Tambaqui win, easily. 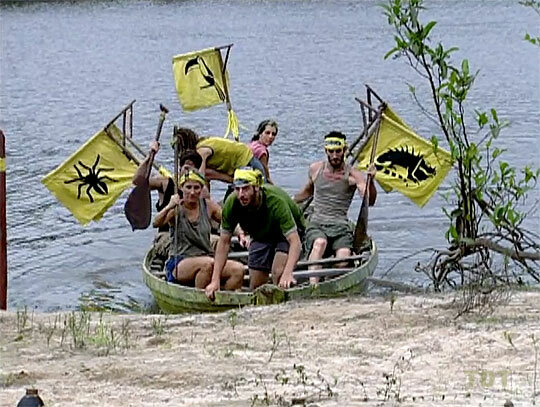 Ep4 IC: "Gone Fishin" - Tambaqui wins. Dave and Jenna depart for night of "fun." By virtue of being the youngest on their respective tribes, Dave and Jenna are sent to an overnight getaway. 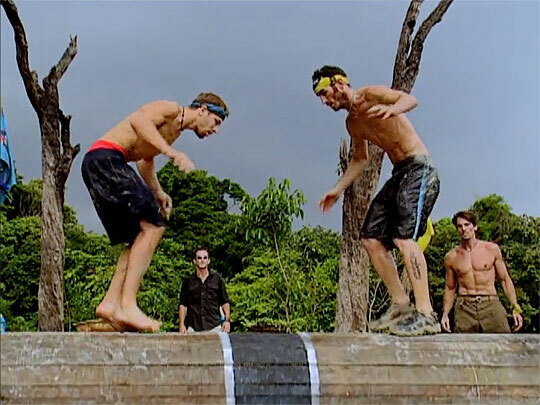 After bathing and feasting, they are rejoined by Probst, who forces them to select new tribes. Dave picks Heidi, based on all the Jaburu info Jenna divulged. Stage 1: Word scramble. Each tribe has 10 Amazon-related images, of which only five are in their word scramble. They must find the five words before proceeding. Stage 2: Paddling. Tribes must paddle out into the lake, gather the five corresponding flags, then return them to their box on the beach. New Jaburu takes the lead on the word search, wins fairly easily. 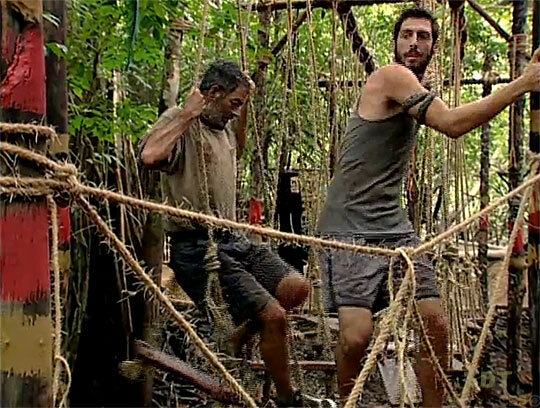 Ep5 IC: "Up the Creek" - Jaburu wins. Deena sits out (Jaburu had to choose a woman to sit out). Simple log rolling competition for points, man vs. man, woman vs. woman. First tribe to 5 points wins. Results: 1.Matt d. Roger, 2.Shawna d. Heidi, 3.Dave d. Alex, 4.Butch d. Rob (tied, 2-2); 5.Christy d. Jenna, 6.Alex d. Roger (tied, 3-3); 7.Shawna d. Heidi, 8.Butch d. Matthew (tied, 4-4); 9.Christy d. Jenna again. Tambaqui wins spices and fruit. Jenna sits out. With hands tied behind their backs, tribes must bite off as much beef from a hanging bone as possible in 10 minutes. Tambaqui wins, allegedly. Ep6 IC: "Piranha Feast" - Tambaqui wins. The tribes receive keys unlocking a box in each camp, which contains a message telling them they're merging. They paddle to a new location, receive new buffs, then feast and build a new camp. Stand on a log (4 inches X 12 inches) until you don't. Order of elimination: At 30 minutes, 10.Jenna and 9.Heidi strip and jump off for Oreos, cola, and peanut butter. 8.Roger (35 min., no food). 7.Butch, 6.Rob, 5.Alex (1 hr, all for pizza). 4.Matt, 3.Dave (1 hr, 51 min., for buffalo wings). At 2 hrs, 40 min, Probst offers spaghetti and meatballs. Deena and Christy decide to share it, rock-paper-scissors for who jumps first. 2.Christy loses, 1. Deena wins. Ep7 IC: "Perch" - Deena wins. First part in teams of three, second part individual. First part: Tethered to bungee, retrieve five flags from the mud. Teams: Green (Christy, Rob, Butch), Purple (Dave, Deena, Alex), Orange (Jenna, Matt, Heidi). Results: Purple-5, Orange-4, Green-3. Individual round (3 flags): Dave-3, Alex-2, Deena-1. Dave wins bath & banana split reward, brings Deena, whom he pick after he holds up two fingers behind his back, asks Deena and Alex to guess, and Deena is right. Contestants are told to decorate masks as self-portraits, then bring them to the challenge. 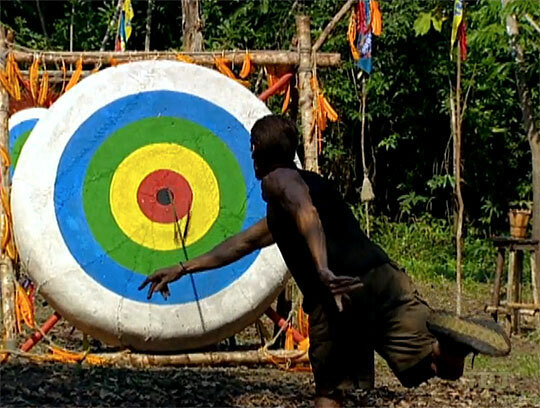 It's a coconut chop, with Probst asking Amazon trivia. Q1: Dave chops Matt, Deena ch. Matt(2), Matt ch. Dave, Alex ch. Dave(2). Q2: Heidi ch. Matt (3, out, 9th), Matt ch. Dave (3, out, 8th), Dave ch. Alex, Deena ch. Alex(2), Alex ch. Deena, Christy ch. Alex (3, out, 7th). Q3: Deena ch. Rob, Heidi ch. Rob(2), Jenna ch. Butch, Christy ch. Rob (3, out, 6th), Butch ch. Jenna. Q4: Heidi ch. Butch(2), Butch ch. Heidi, Jenna ch. Butch (3, out, 5th), Christy ch. Deena(2), Deena ch. Christy. Q5: Christy ch. Heidi(2), Deena ch. Christy(2), Heidi ch. Christy (3, out, 4th), Jenna ch. Deena (3, out, 3rd). Q6: Heidi ch. Jenna(2), Jenna ch. Heidi (3, out, 2nd). Jenna wins. Ep8 IC: "Face Off" - Jenna wins. First round: Blowdarts (top four advance). Scores: Christy-3, Matt-10, Butch-5, Rob-3, Alex-7, Jenna-3, Deena-5, Heidi-miss. Second round: Spears (top two advance). Matt-10, Deena-miss, Butch-3, Alex-7. Final round: Bow and arrow. Matt-3, Alex-5. Alex wins coffee and pastries reward, brings Jenna. Placement: 1.Alex, 2.Matt, 3.Butch, 4.Deena, 5-tie.Rob, Jenna, Christy, 8.Heidi. Ye olde gross food contest. Round 1 (grasshoppers, first 6 advance): 8.Jenna refuses, 7.Heidi out. Round 2: (10 babasu coconut worms, first 4 advance) 5-t. Rob,Butch out. Round 3 (5 baked beetles, first 2 advance): 4.Christy throws up, 3.Alex out. Round 4 (live beetle larva): Matt swallows his whole, wins; Deena second. TC9 - Deena voted out (6-2), 7 players left. Contestants receive wallets with $500, on which they can bid for food and/or other items. Results as follows. 1.Heidi-cheesecake, $120. 2.Alex-a (covered) plate of manioc, for $240 (after turning down a chance to swap for what turned out to be lasagna). 3.Matt- cheeseburger and fries, $400. 4.Jenna- peanut butter and chocolate, $320. 5.Butch- bacon, eggs, pancakes, plus a bed and pillow. 6.Rob- protein bar (no price). 7.Heidi- cake (no price). 8.Alex- steak and potatoes, $240. 9.Christy (who had no food)- letter from home for $340. 10. Jenna gets her letter for $120. Contestants receive quizzes about their tribemates in camp early in the day. The challenge itself is held at night. Contestants must guess the most common answer to questionnaire. First person to five wins. Q1: Rob, Jenna, Butch-1. 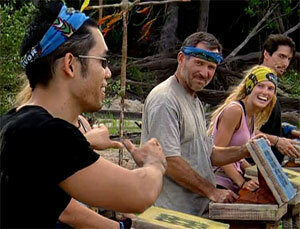 Q2: Heidi, Matt, Christy, Alex-1. All tied at 1. Q3: Matt-2. Q4: Matt-3, Rob/Christy/Butch-2. Q4: Matt-4, Rob-3, rest-2. 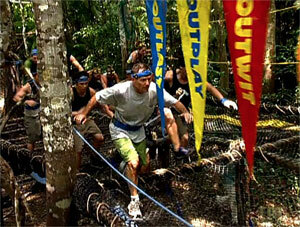 Q5: Matt/Rob-4, Christy/Butch/Alex/Jenna-3, Heidi-2. Q6: ("Who do I have a crush on?" - correct answer Heidi) Rob-5, Matt/Christy/Butch/Jenna/Alex-4, Heidi-3. Rob wins! First round: Race out, dig up one of four paddles from under multiple sandy mounds (two people eliminated). Second round: Paddle out to buoy with trivia question and four answers. Grab bag matching answer, paddle to puzzle station. Do puzzle (only one bag has right pieces). First two with correct pieces continue. Winner gets loved one visit. Results: 5-t. Butch, Heidi out in first round. Jenna, Christy swim instead of paddling. Matt first to shore, has the right pieces, gets started on his puzzle. So does Rob. t-3.Jenna, Christy out. 1.Matt wins, 2. Rob second. First stage: Slingshots, break your own plates, releasing pucks. Results after Rd.1: Jenna, Butch-5, Heidi-4, Christy-3, Rob-2, Matt-1. Second stage: Shuffleboard, using those pucks. Rob gets knocked into the closest spot twice, then Butch knocks Heidi closer. 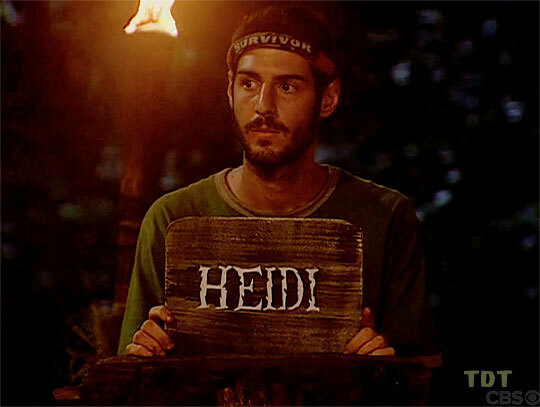 Jenna has the last shot, knocks Heidi & Rob out, wins. 1: Jenna; 2-tie: everyone else. Ep11 IC: "Shoot 'n' Shuffle" - Jenna wins. (Car challenge.) Escape a cage by untying knots, then solve a plank puzzle. Use a rope swing to cross a gully, go to decoding station, decode a message to retrieve a key. Climb tower, use key to unlock flying fox, get the last key, which is for the car (a Saturn ION). Reward includes a tailgate party with food. Butch first out of the cage, then Matt, Rob, Jenna. Rob first to finish puzzle, then Matt, Butch. Matt first to decode, wins. 1.Matt, 2-tie.Rob/Butch, 4.Jenna (still on puzzle), 5.Heidi (still in cage). Ep12 RC: "Try Again" - Matt wins an ION. Ropes obstacle course, with five different types of obstacles. Each contestant must collect five feathers, one at a time, and place them on the central pole. First to five feathers wins. Results: 1.Matt-5 feathers, 2.Heidi-3 feathers, 3-tie.Rob, Butch, Jenna-2 feathers. Blindfolded maze. 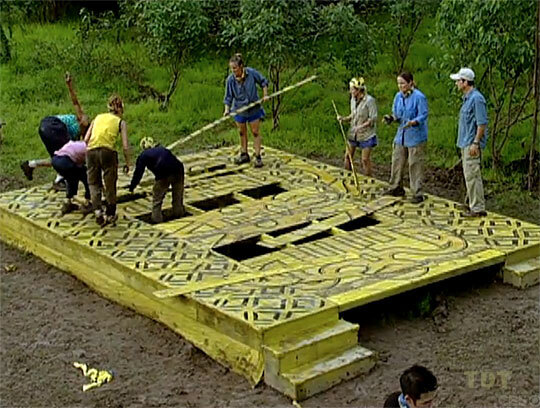 Contestants must feel their way through a maze and collect four different necklaces (earth, wind, fire, water), then return to the center station with all four to win. Matt and Jenna retrieve their third necklaces at roughly the same time, and race to the finish. Results: 1.Jenna-4 necklaces, 2.Matt-3, 3.Rob-2, 4.Butch-1. Ep13 F4 IC: "Braille Maze" - Jenna wins. 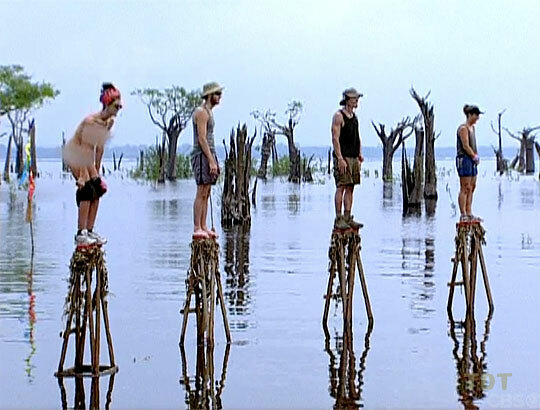 Stand barefoot on a narrow perch, holding a headdress over your head, until you can't. 1.Jenna, 2.Rob, 3.Matt (who steps down almost immediately). No times shown. Ep13 F3 IC: "Will Power" - Jenna wins. Jenna and Matt face the jury. Jenna wins easily, 6-1. Final Tribal Council. Jury votes for Jenna, 6-1. Castmembers return to Los Angeles, make connecting flights home.